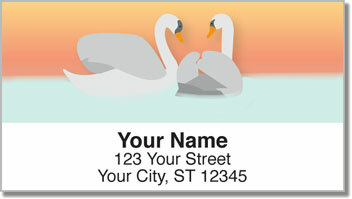 Subdued illustrations of a pair of swans floating silently on the water create a charming set of return address labels. Swans are some of the most romantic birds on Earth. A pair will spend their entire lives with each other raising cygnets together each spring and rarely leaving the other's side. 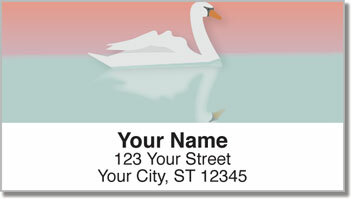 Mute Swan Address Labels capture the serenity of a quiet lake at sunset. They'll give your letters and packages a lovely look while saving you a considerable amount of time. Say goodbye to scribbling out your name and address on every envelope. With these self-adhesive labels, all you do is peel and place! 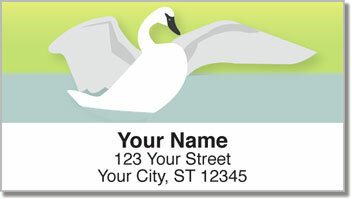 Make Mute Swan Address Labels your own today! 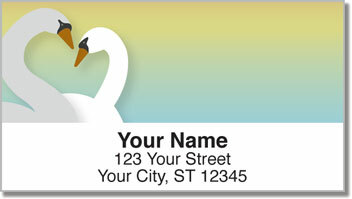 This design can also be ordered in matching personal checks.